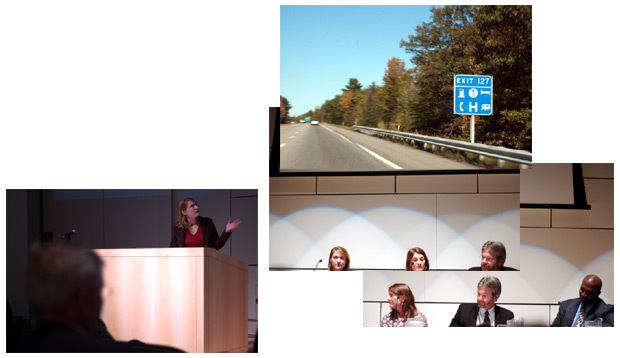 Lovejoy Panel: I went to the Elijah Parish Lovejoy Award ceremony at Colby College, about 20 minutes north of Augusta in Waterville, Maine. (Exit 127 on I-95; that is 127 miles into Maine according to the new mile marker/exit numbering system.) Every time I drive somewhere I think, 'do I really need to go there' or 'do I really need to drive.' I thought that going up to Colby for this event might be worth the death I cast on the future by burning fuel. I was right. First was a panel discussion on the Iraq war with Andrea Bruce (Woodall), Washington Post photographer, Christine Spolar, Chicago Tribune foreign correspondent extrodinare, Bill Nemitz, Portland Press Herald correspondent, and overseeing the panel Gregory L. Moore, Denver Post editor. And Andrea Bruce had some nice pictures, however I had already looked at them earlier online. I was only really interested in talking to Andrea after the panel. And I just wanted to talk about D.C. I found out she didn't live in D.C. (somewhere in Maryland I think), and I asked her to bring me some chicken from Pollo Sabroso (Peruvian chicken from my old neighborhood of Mount Pleasant) next time she comes up. She may not know where that is, but she should. John Burns: John Burns, senior foreign correspondent for The New York Times, claimed that journalists were not the best public speakers. He must not have been talking about himself. This man has ka-knowledge. About media coverage in Iraq. 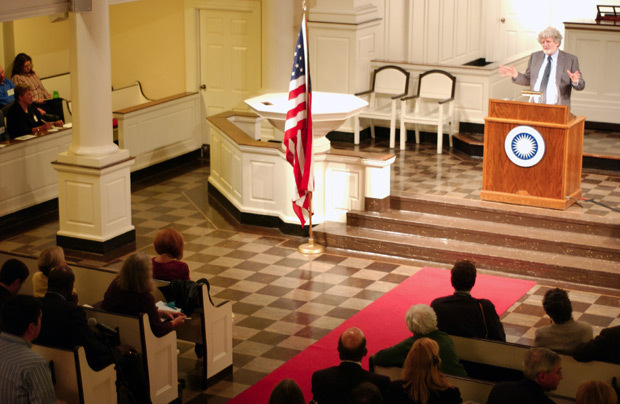 And he was dropping it last night at Colby College's chapel. And he is very well-spoken for a Brit. Although, he himself admitted, he needs a haircut. Really. 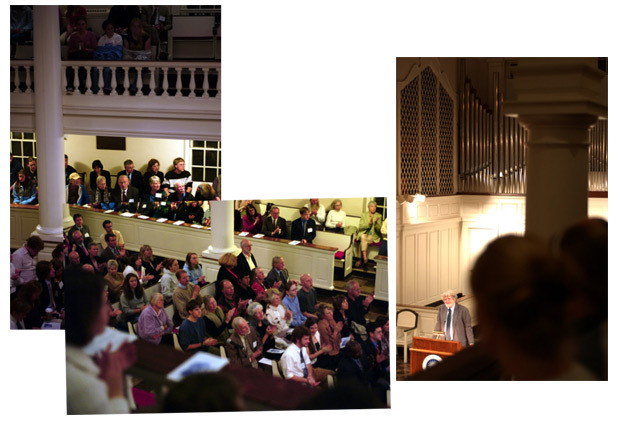 Packed for Convocation: I can't see that little chapel at Colby being much more full. But as honoree John Burns said, we were really there to celebrate the memory of poet, abolitionist, newspaperman, and all-around good guy Elijah Parish Lovejoy who was killed by racists 170 years ago while defending his printing press. Lovejoy was from here. Awesome! I definitely need to learn more about this man. Overall: I am smarter now for having attended the Lovejoy Convocation. Plus, I got a couple free beers (Shipyard Beer from Portland, Maine), and from the kindness of one of my unmet colleagues who couldn't make it, a free dinner before the ceremony. Wicked!